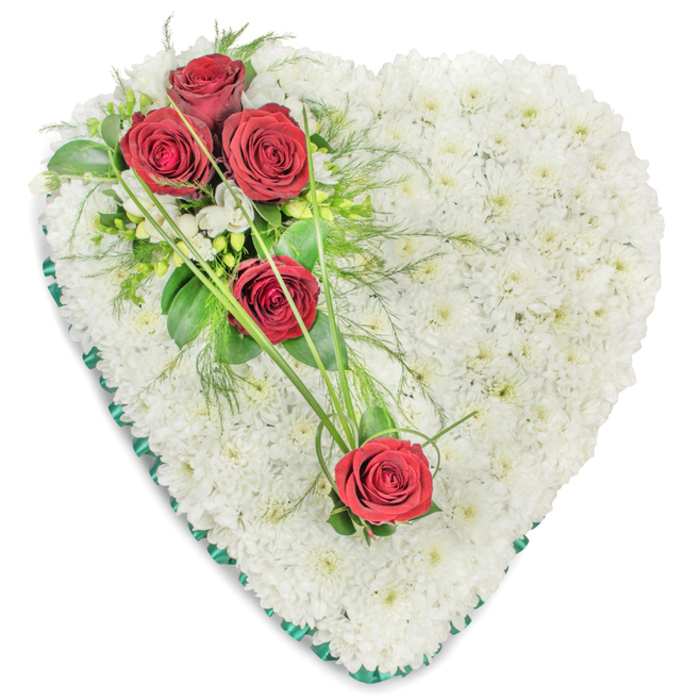 Delicate white chrysanthemums, lavish red roses, white freesia and bear grass are combined to create this elegant heart-shaped tribute which is made to express your sincere condolences. Top flower shop. Very punctual and professional. Wonderful selection of flowers. It was easy to choose and order the flowers that my family needed. The flowers were delivered to the funeral directors. I received an email confirming that the delivery had been made which was very helpful. Last week was extremely difficult for me and my family. We were deeply saddened by the loss of our darling grandma. I ordered the funeral flowers by this company and was very impressed by their beauty and freshness. Thanks a lot! Very beautiful tribute - fresh roses and chrysanthemums which were presented in an elegant way. Recommend their services! My family ordered three funeral arrangements from them, and the tributes arrived on time, looking very beautiful and classy. Their florists know what they are doing. Lovely assortment of tributes. It was great that they were delivered on time. Great job!